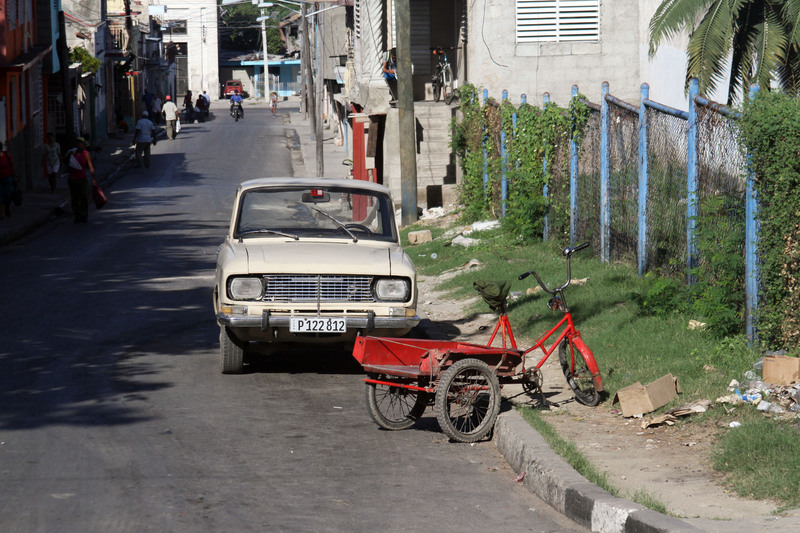 Santiago, our first look at Cuba. 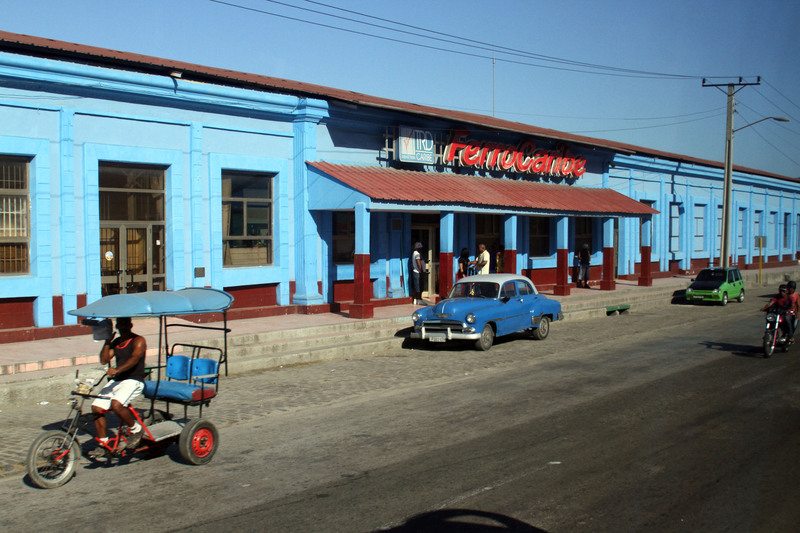 Santiago, Cuba was our first excursion port. 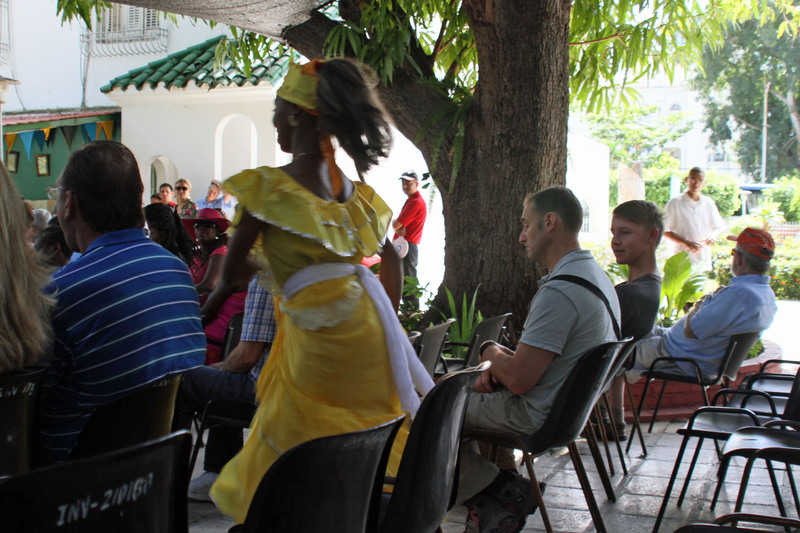 As Americans, we were allowed into Cuba as part of the People to People program that included educational lectures and excursions as well as opportunities to meet Cuban people and learn about their culture from their stories, dance, music, and history. At each port we learned that the Cubans could decide from one day to the next what restrictions and procedures they wanted to put in place to welcome us. For our first visit, we were to line up in the entertainment lounge to have our temperature taken before being admitted into their country. Their free health care system lends itself to some pretty good care for their people and some paranoia about Ebola and other diseases. 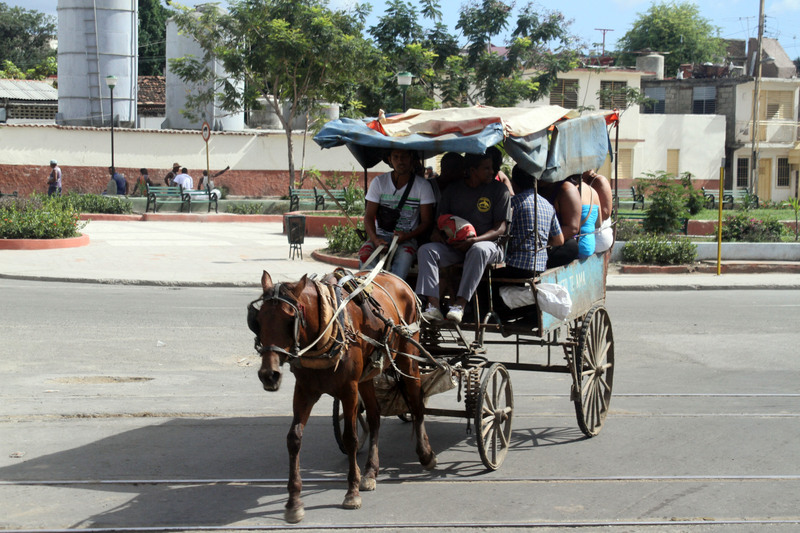 After getting the okay from the doctors, we boarded our buses for our first glimpse at the forbidden land of Cuba. 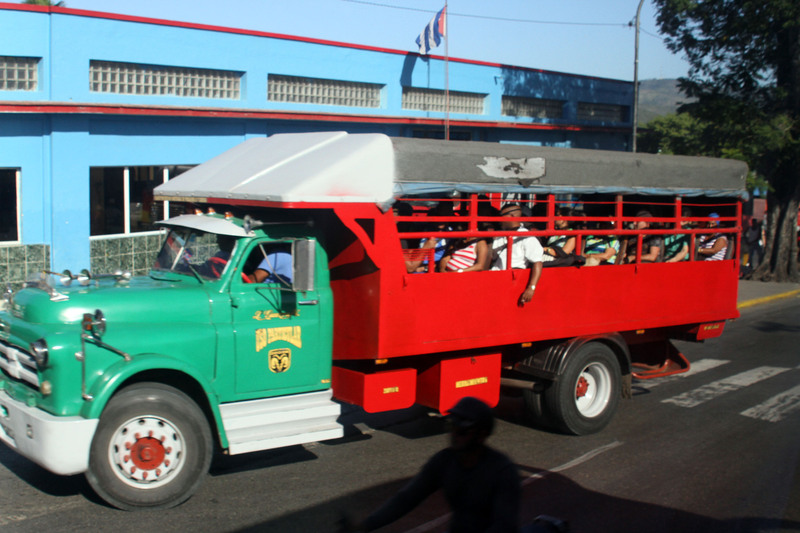 We expected to see the old cars, and did, but I think the presence of horse-drawn carriages, and packed trucks stood out as well. I also noticed numerous women pedestrians with their children walking with umbrellas—to keep out the sun, since there was no rain in site. We seemed to circle the same main area of town stopping first at a large square—mostly empty but surrounded by monuments and several buildings with wire framed images of their “heroes.” Our guide said the Cubans like to celebrate their heroes but I had a feeling that who they regarded as heroes was subjective, regardless of the monuments and statues littering the land. 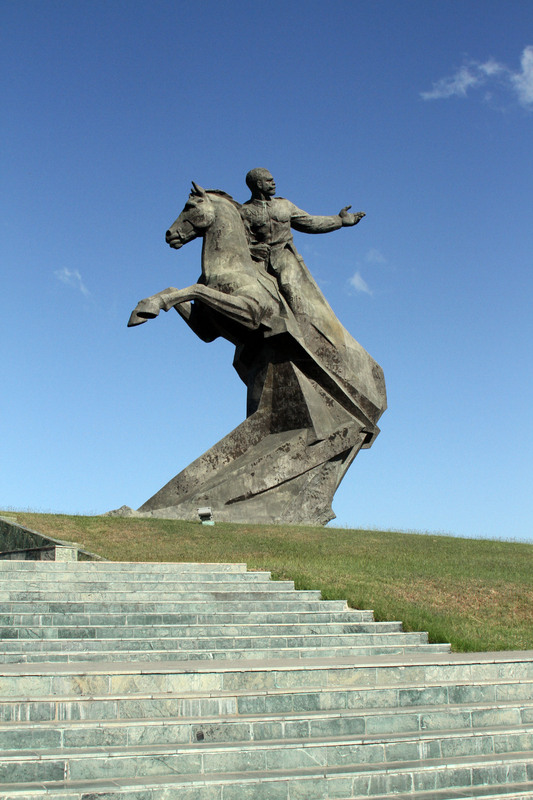 The outlines of faces depicting Castro and Guevara were on buildings here and elsewhere and the huge statue of a man on a horse on top of the hill in this square was of a 19th century leader for Cuban independence, Antonio Maceo Grajales. 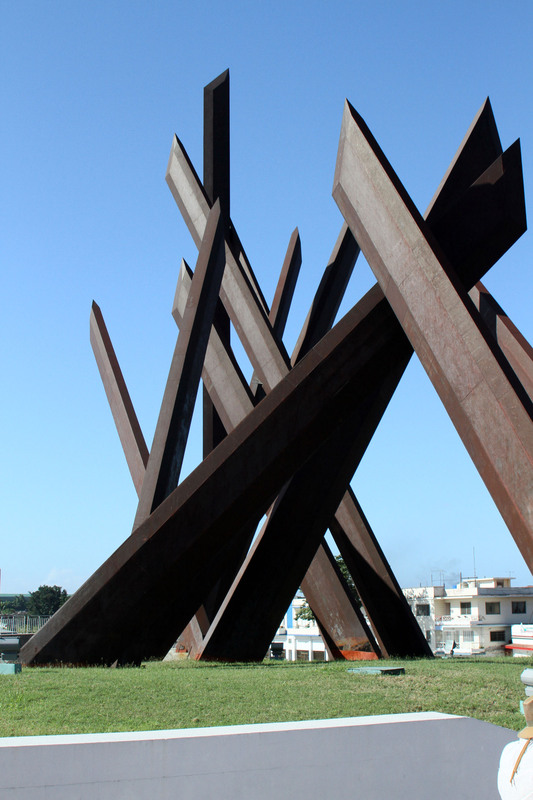 The statue is massive and there are a couple dozen large steel structures coming out of the ground at various angles that represent machetes. 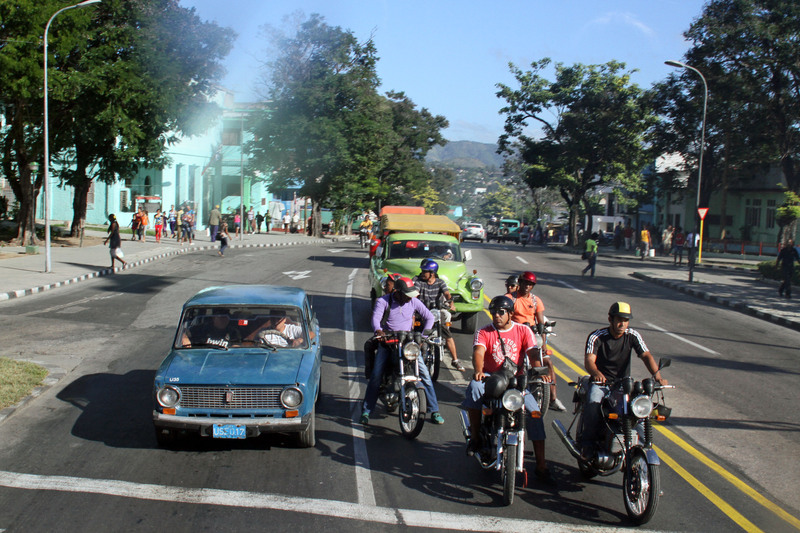 We didn’t’ get a lot of history lessons outside of the Castro revolution but there is a deep history with a mix of cultures in this large Caribbean country. We were taken to what most Americans may recognize as part of our own history, San Juan Hill. Teddy Roosevelt won the day and ground here with the Rough Riders during the Spanish-American war (which the Cubans called the Spanish-American-Cuban War). It was somewhat nondescript but it had a beautiful view of the mountains in the background. 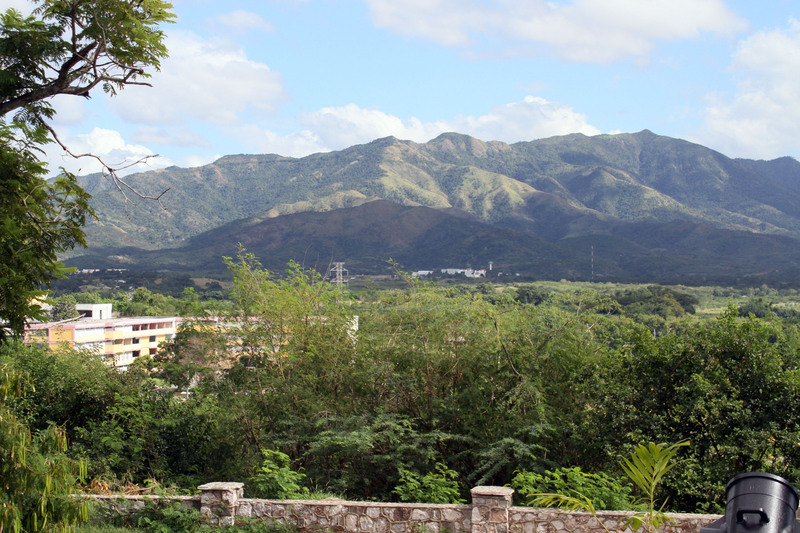 I never thought of Cuba as having mountains but it’s a sizable and includes several mountain ranges and reefs off the beaches. Part of our cultural experience included a stop at the African Cuban Institute. 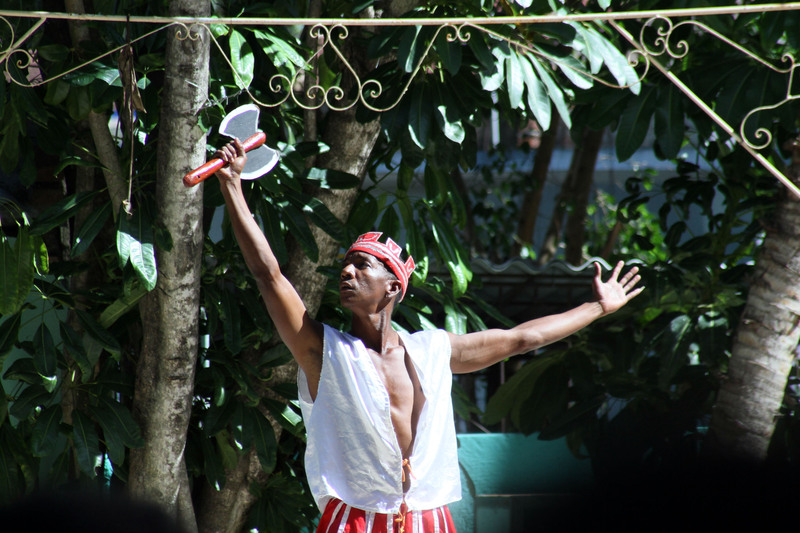 We were entertained by dancers and singers, and a lesson in the history of the various groups that mixed to bring each of their historical traditions together to form a unique Cuban culture. 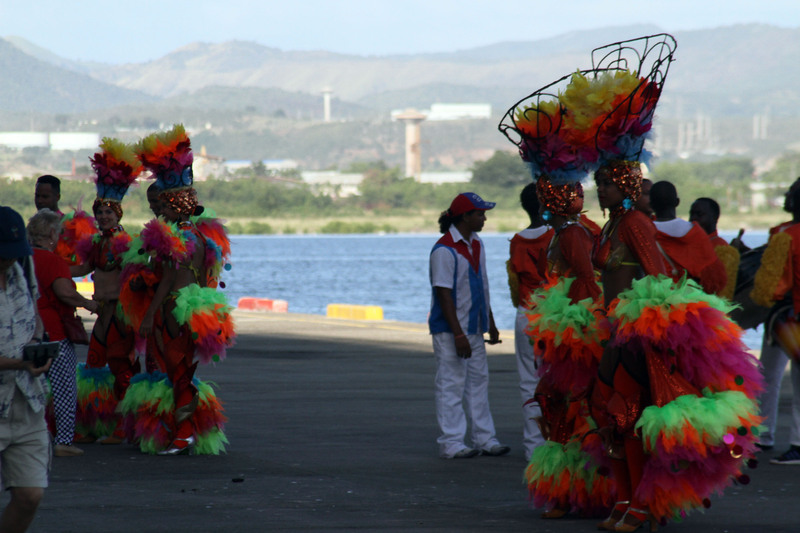 The music and dancing were fun and I was grateful they didn’t force us to get us to dance with the rest of the group during the unending song, Guantanamera—which became one of those songs that stuck in your head for days. As we left I noticed familiar human interactions—such as a local cop scanning a smartphone with his friend, some locals earning cash selling produce out of wheelbarrows, those selling wares of all kinds from little stands, and more (not so different from our small entrepreneurs in the country and city). We drove back to the ship after stopping at a “western” hotel for a break. We had a little laugh at the gift store/bookstore that sold primarily books by the Cuban leaders and anti-American stories about Guantanamo Bay and endless shots of Che Guevara, which I was to later understand was a revolutionary “hero” of the Cubans (but probably not really since he murdered so many of them). We set sail that afternoon for a rough ride around the island passing Guantanamo Bay in the evening. We could see a number of lights on shore shining on the compound and base as we headed east before turning north and west toward Havana, our next stop. It would take us some time to get there as Cuba is quite large. During sailing hours our crew offered a number of lectures and fun sessions on food, cigar rolling, dancing, and more. 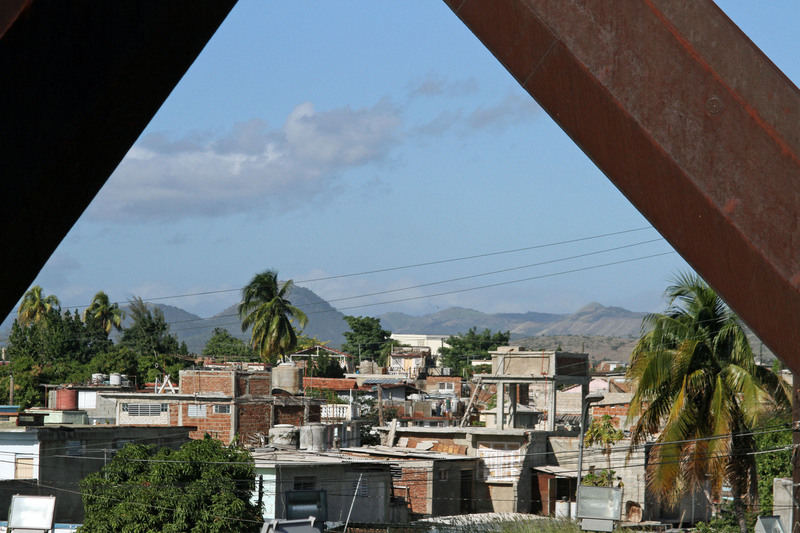 Next post covers our wonderful stay in Havana.